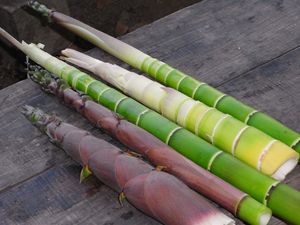 Below are the recommended plant species for harvesting edible shoots. Shooting season for runners is usually in Spring with the clumpers shooting in Summer and early Autumn. Shooting times are delayed (or even missed) during periods of drought. New shoots can grow up to a metre a day once the stand/grove/clump is mature.